If you would like to focus on your e-learning portal and not on technical minutiae, DNMark.com is the perfect place for you. A one-click script installation is offered directly at signup. You can order a e-learning optimized web hosting package for only $2.75 per month, along with a new domain name. 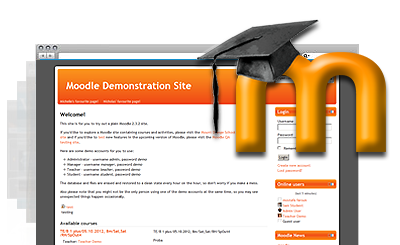 Moodle™ is a registered trademark of Martin Dougiamas and shares no connection with DNMark.com. eTeaching hosting made simple with DNMark.com! DNMark.com satisfies all requirements for hosting e-learning websites. DNMark.com offers an exceptional customer care service.